A pumpkin pie in bar form with a cake mix crust, pumpkin custard filling, and a cinnamon cake-mix crunch topping. These bars are perfectly soft, pumpkin-y, and comforting. 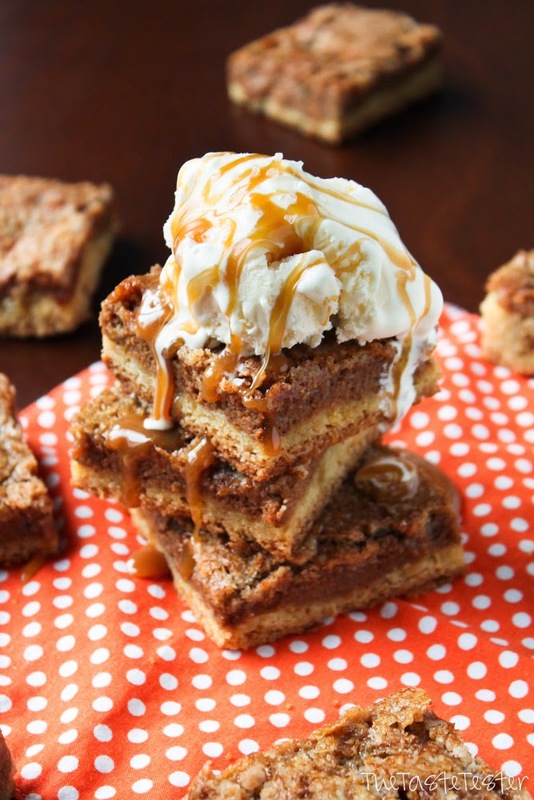 They are best when served topped with vanilla ice cream, caramel sauce, and a little sea salt. 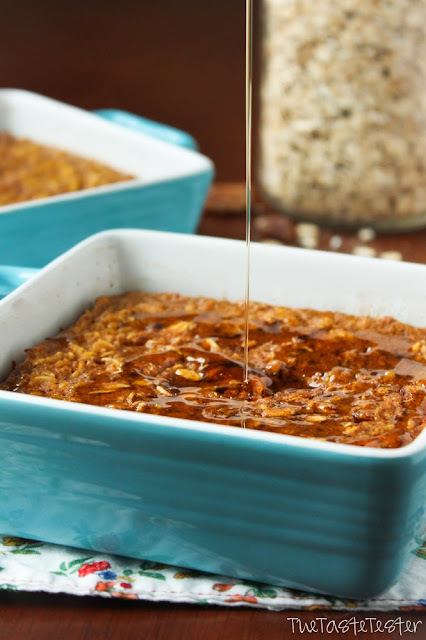 Soft-baked oatmeal flavored with pumpkin puree and pumpkin pie spice, drizzled with pure maple syrup. It's a dessert in breakfast form, only healthier! 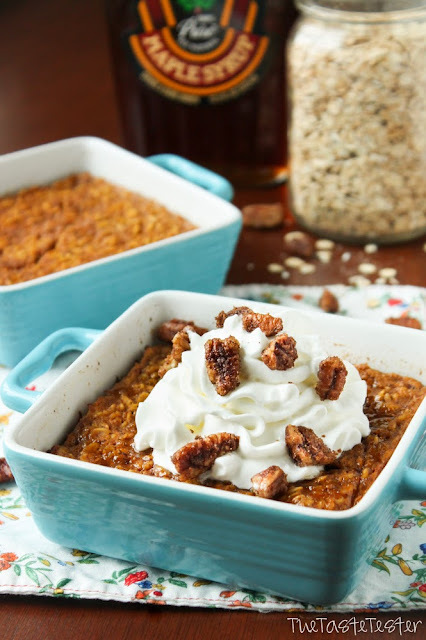 Serve warm topped with pumpkin-pie-spiced candied pecans and a heaping spoonful of sweetened whipped cream. 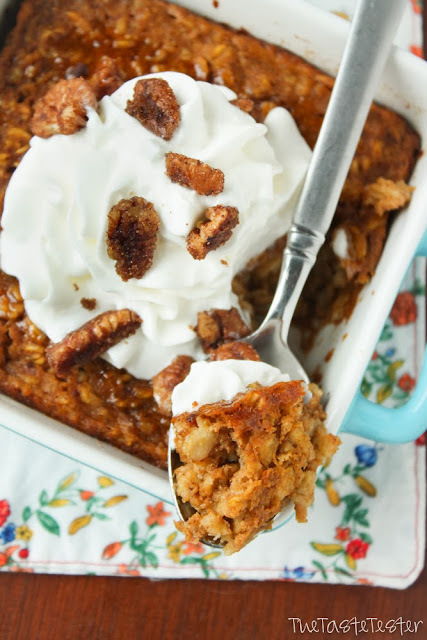 If you've never tried baked oatmeal before, this recipe is a great one to try for the first time. I've made it four times in the past three weeks, because I just LOVE it! Pre-heat the oven to 350˚F. Grease two (2-cup) ramekins with non-stick cooking spray. Mix all of the above ingredients in a medium sized mixing bowl. Divide oatmeal mixture evenly between the prepared ramekins. Cover with aluminum foil and bake covered for 20 minutes. Uncover and bake for 12-15 additional minutes or until a toothpick inserted in the center comes out clean. Serve warm with spiced candied pecans (recipe below) and pure maple syrup. We also like to top ours with a little whipped cream. This recipe can easily be doubled and baked in four ramekins, as directed above. Or it can be doubled and baked in a greased 8x8" pan. If baking in an 8x8" pan bake for 25 minutes covered and 17-20 minutes uncovered. Heat a small non-stick skillet over medium high heat. Combine all of the candied pecan ingredients in a small bowl. Pour into skillet and spread into an even layer. Cook for 3-4 minutes or until nuts smell warm, toasted, and fragrant (but not burnt). Cool on a piece of parchment paper. Sweet and salty cheerio granola bars dipped in white chocolate candy melts. 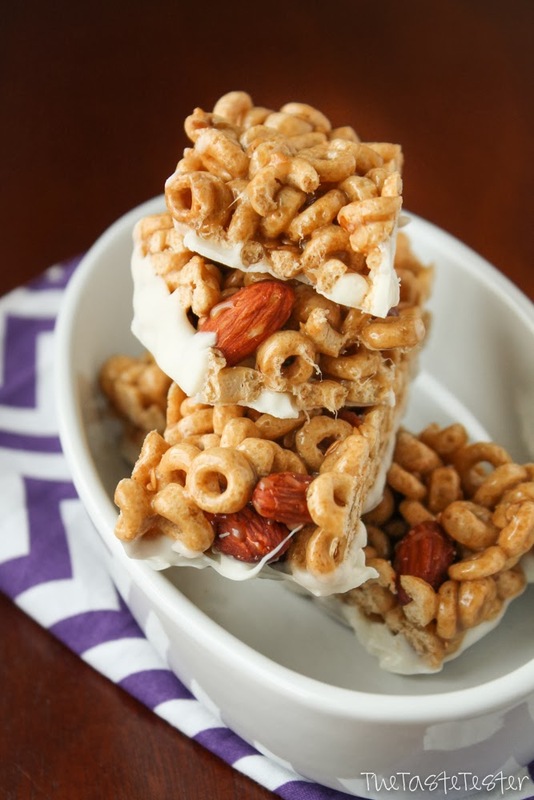 These bars are a sticky treat that can't be beat. They'll be gone in seconds, promise. 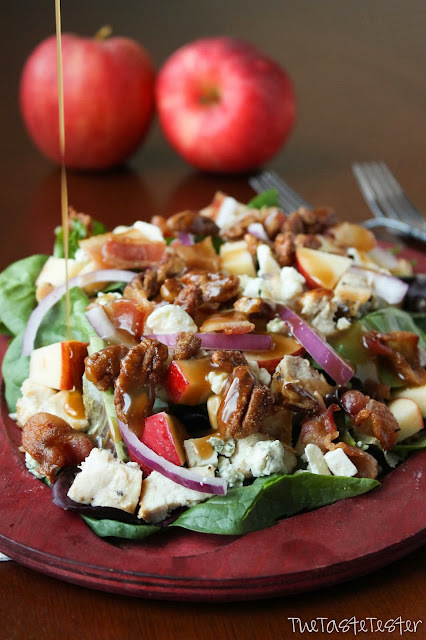 Crisp fall apples atop a bed of fresh greens paired with red onion, savory chicken, blue cheese, maple-cinnamon candied pecans, and bacon pieces. The salad is finished with a garlic-dijon vinaigrette. A savory pizza with cheddar and mozzarella, bacon, parmesan cheese, and sliced potatoes. It's like potatoes au gratin in pizza form. 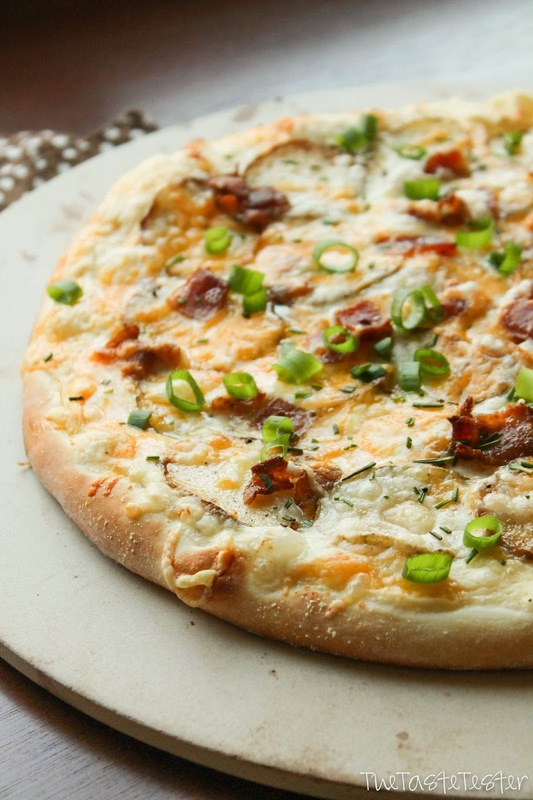 The sprinkle of fresh rosemary and chives or (green onions) is the perfect finishing touch for this delectable pizza! 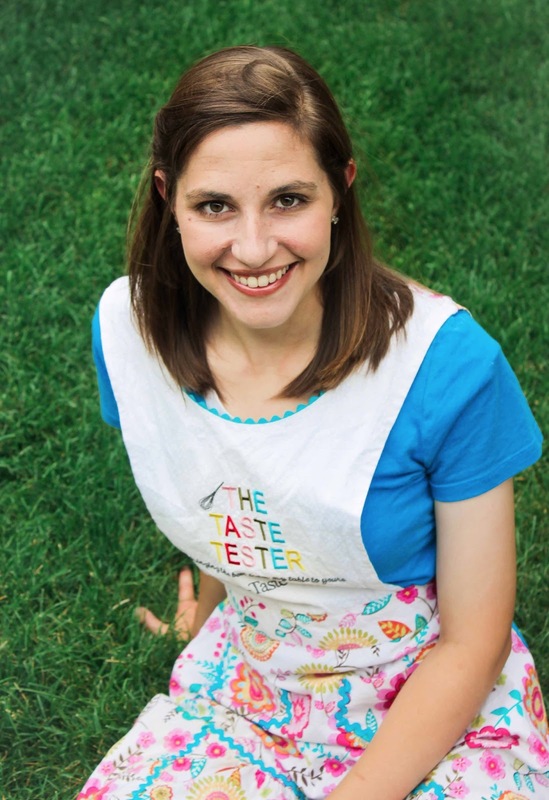 My name's Amanda and I love concocting outrageously delicious recipe ideas. Every once-in-a-while these crazy yummy ideas of mine come to life and I document them here.